Sticky Password may not yet have the brand clout of LastPass, but it’s a great password manager to choose. It secures your passwords and other information in an encrypted database so that only someone with the master password can decrypt and read it. The app also helps you create new logins, or change passwords for your accounts. How Good is Sticky Password? If you’ve been holding off getting started with a password manager, there’s never been a better time to take the plunge. With numerous data hacks hitting the deadlines, it makes sense to stop relying on the same old (guessable) passwords across multiple sites, and put your security into expert hands. Sticky Password is simple to use, effective, and good value, too. While we wouldn’t rate it as highly as Dashlane, Sticky Password does a similar job, at a cheaper price. Sticky Password automatically logs you into sites the minute you land on their login page. If you have multiple accounts for any one site, you can choose which account to log in with. Changing passwords is similarly easy. Login to a site and go to the change password page. Typically, when you do this, you have to enter your old password and then type in a new one. Sticky Password handles all of this for you, and will even click the Save button for you. This isn’t quite as simple as the auto-changing password features of Dashlane and LastPass, but it’s no hardship, either. There’s also a helpful security dashboard that analyzes your database for weak and reused passwords. Here, you can go through the key ones that need changing. Unfortunately, as there’s no auto-change feature you’ll have to change them one-by-one. Sticky Password’s secure notes feature is called Secure Memo. It has 10 different templates for storing memos on your driver’s license information, bank accounts, passports, and so on. Sticky Password gives you far more syncing options than most other password managers. You can, for example, choose not to sync your password database via Sticky Password’s cloud servers (the default for most people), even if you’re a premium customer. Instead, you can optionally move your database around to different devices manually, or via a service such as Dropbox. Sticky Password also offers a “local Wi-Fi sync” option to premium customers. This allows you to sync your data between two different devices over a local network. It’s a nice feature for the extra cautious and technologically adventurous. Sticky Password also comes in a USB portable version. Instead of installing Sticky Password on your desktop, you can put it on a USB key and run it on any PC you want. Just keep in mind that you should still only use the USB portable version on PCs you trust. Sticky Password has all the basics of a password manager, and some very good auto-login features, but it does have a few downsides. Sticky Password does not adhere to current best practices for password creation. Currently, security experts advise using a random combination of easy-to-remember words to create one extra-long pass phrase. You can choose to separate these words by a hyphen or underscore, for added complexity. Sticky Password, by comparison, still advises you to use a password of random characters with at least one upper and lowercase letter, numbers, and optional special characters. This advice is fast falling out a fashion – just as well, as it can mean passwords that are as hard to remember as they are to guess. The desktop app for Windows is fine, but a little dated. It looks like something designed for Windows 7, and is not reflective of more modern designs. One significant problem this poses is that the text for each entry is small, and the database just generally looks crowded. Maximizing the window doesn’t fix this either – it just adds more entries in the window. Using Sticky Password on WIndows 10, the desktop program can be slow to respond in certain situations. Typically, this was after launching the program from the system tray, or when the program was syncing with the cloud. The bookmarks feature needs a little work. The obvious place you’d want to use them is, of course, within a web browser. Astonishingly, however, you cannot save bookmarks via the Sticky Password browser extension. Instead, you have to manually copy the URL, then open the Sticky Password desktop program, and create a manual entry. That’s a lot of steps. It would make far more sense to click on the browser extension, hit an “add bookmark” button and automatically save the page you’re on to your database. Finally, the notes feature could use some enhancements. Its templates, for example, look like something you’d create yourself using Microsoft Word. There’s also no way to save attachments, the way you can in LastPass. Nor is there an option to save documents, as in 1Password. While these aren’t as key as the main password storage function, an attachment or document could be a great way to, say, save the answers to identify-verification questions or receipts for software licenses. There’s both a free edition of Sticky Password and paid-for (premium) plans only. We think the latter are the better choice, and fortunately, these are competitively priced, and this level of security is well worth the small fee. You can enjoy most of the benefits of Sticky Password on the Free plan, but you do miss out on a few crucial features. Chief among these is cloud sync and backup across multiple devices. In short, if you only wish to use a password manager on one device only, then Sticky Password Free is a perfectly good choice. However, most users will need to manage their logins between a a laptop, phone and tablet, and it’s worth spending a little money to ensure all your password details sync seamlessly between devices, no matter which you’re using. A single user license for Sticky Password costs $30 per year. Out of the big names, this is beaten only by LastPass ($24 per year). 1Password and Dashlane are more expensive than Sticky Password for annual licenses. Or, you can buy a lifetime license for $120. The lifetime licensing option is nice for users who plan on making a long-term commitment to Sticky Password. Sticky Password doesn’t offer an enterprise or small business option. However, Sticky Password partners with third-parties, such as Kaspersky, to bundle its services with other products. Getting up and running with Sticky Password is very simple. Download the program to your desktop, install it, and then set-up a new account inside the app. Usually, this just requires you to enter an email address, choose a master password, and select which browsers you need a Sticky Password extension for. Creating a master password is easy – this is the one and only password you’ll need to remember. It locks away all your other, stored passwords. Be sure to choose one that’s secure, yet memorable for you. Enter a new master password and a progress bar at the bottom tells you whether your password is strong or weak. The Sticky Password app takes a little longer than usual to boot after the initial sign-up process, compared to most systems. But, after this point, everything is automated, including the installation of all your various browser extensions. 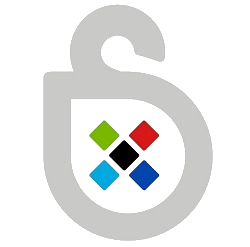 Sticky Password automatically detects all supported browsers installed on your system. It supports up 16 different browsers on four platforms (Windows, Mac, iOS, and Android). Sticky Password will detect when you enter a new password and offer to save it for you. You can even import a database of passwords from a different manager, if you’ve used one previously, by going to Menu > Import. 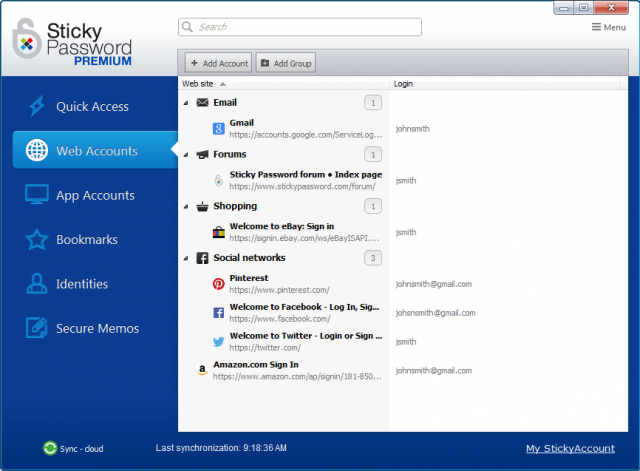 Sticky Password is good, though not quite perfect for a password manager. Its automatic login feature makes it easy to access your accounts online, and creating new passwords is a breeze. But Sticky Password’s design could use some further development. The desktop program for Windows can be slow at times, the bookmarks feature should be updated to work within the browser extension, and the secure memos feature could be more robust. Still, it’s priced well, and there’s no question that Sticky Password makes saving and changing passwords secure and easy.